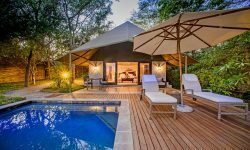 An exclusive 5 star lodge, Savanna is situated in the internationally famous Sabi Sand reserve within the greater Kruger National Park. Savanna lies in the area where the Big 5 are frequently sighted, being lion, leopard, elephants, buffalo and rhino. Game drives are conducted by highly professional guides and trackers. 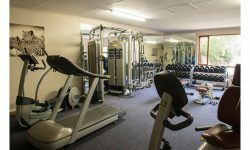 The staff are extremely friendly and guest are made to feel at home immediately. The Lodge consist of 9 spacious and luxurios accommodation. 7 suites have tented roofs, blending the elegance of the by-gone colonial era with modern facilities. The decor is colonial and classic with crafted furniture, fine linen and beautiful artwork. 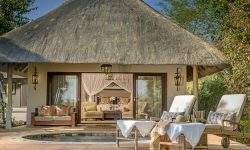 3 Executive Suites and 4 Luxury Suites offer a unique ‘Out of Africa” experience with canvas roofs draped ceilings set on permanent structures. Larger Executive suites offer plunge pools. 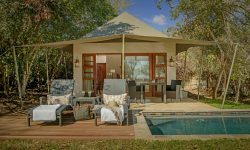 The camp is family friendly offering the Thatched Savanna Suite with 2 en-suite bedrooms on either side of a spacious lounge area and a large patio. Bedroom suites can also be booked with individual rooms. The public area has a relaxing lounge, Internet facility, a swimming pool, great views of the Waterhole. 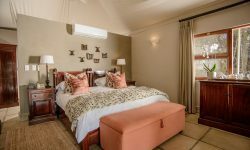 Children of all ages are welcome with their families when booking the Savanna Suite, however no children under 8 years old are permitted at the main lodge. There is also a Bushbabies program for kids where they can learn and be entertained.